Are you interested in taking cake decorating classes? Cake decorating classes can be a great way to explore your creative side. Learning to decorate cakes and cupcakes can be a rewarding hobby or even a new career. The art of cake decorating has been growing wildly in popularity and there is really no limit to where it can take you! I know it’s one of the best things I’ve learned. **Update 4/18/2019: I no longer teach cake decorating classes or take private students. There are a variety of ways for you to learn cake decorating both online and through other local instructors. There are some home bakery owners and community classes in Oklahoma City and the Metro area. I will update them here as they are submitted to me, this is in no way a complete list of all OKC has to offer. Iisha’s Sweet Expressions: Offers private decorating classes as well as decorating parties. She will customize a class to meet your needs so you get the most out of your class time. Classes are taught in Midwest City or your location. Canadian Valley Technology Center has an amazing cake decorating teacher, Sherri Bastion-Randell. Look for upcoming classes from beginning to advanced. It will be worth the drive to the Cowan or Chickasha campus if it fits your schedule. Francis Tuttle has basic cake decorating classes and individual dessert courses listed under their adult and career courses. They also have baking classes for children from time to time. Belle Kitchen has courses and baking parties with a fun seasonal schedule. They even have date night classes! Have you thought about taking a cake decorating class online? The things I learn and continue to learn are useful to me every single day. As a Bluprint affiliate, I do earn from qualifying purchases, but I am a true fan. I mainly use the Online Cake Decorating Classes but I’ve learned woodworking skills and brushed up on photography. There is just SO much available in their system. Plus, the instructors are top of the line. Cakes are such a wonderful medium! They can become sculptures or paintings and they can be free form or traditional. They are just as open as a blank canvas. I’m really excited to be working in this field right now. There are so many things happening with cake artists pushing the boundaries of what is food and what is art. This is a cake from Wilton’s Cake Decorating Course 2 program materials. I am a certified Wilton Method Instructor, but they’ve canceled most of the in-store programs they used to offer. 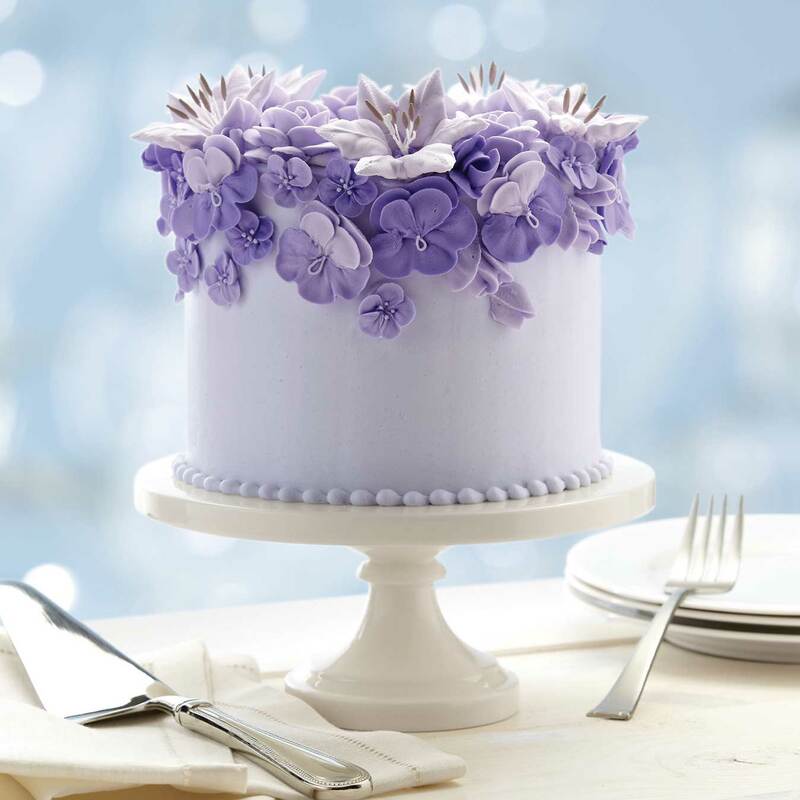 The flowers are made with royal icing and the cake is smooth buttercream w/ a piped border.